January 28, 2019 / Modified jan 28, 2019 9:58 a.m.
State Senator Kelli Ward speaking at the 2015 Arizona Young Americans for Liberty State Convention at Arizona State University in Tempe, Arizona. 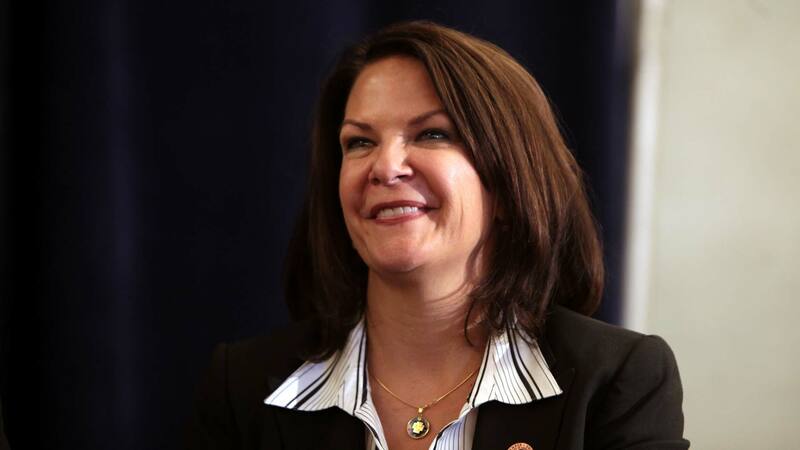 PHOENIX — Arizona Republican activists on Saturday replaced incumbent state party Chairman Jonathan Lines with twice-unsuccessful U.S. Senate candidate Kelli Ward in the party's top leadership post, providing a win for the party's more conservative wing and a defeat for its old guard. Chosen after the party suffered major losses in 2018 races, Ward in her victory speech called her election an opportunity to unify the party and make the state "the Republican powerhouse that we can be." "We will make Arizona red again," she added later. Lines earlier posted a concession note on Facebook, saying it had been his "greatest pleasure to serve" as chairman for two years and wishing luck to Ward. Ward won with 633 votes. Lines had 526 votes, and a third candidate had 65. The state party has been fractured for years between moderates who embrace business-friendly strategies and prefer to avoid hot-button social issues and a more conservative wing that has embraced the tea party and President Donald Trump's initiatives. Sen. John McCain, who died last summer, was a frequent target of those conservative party activists, and Ward, 50, challenged him in the 2016 primary but lost by 11 percentage points. She ran again for retiring Sen. Jeff Flake's seat this year, but lost in a three-way primary won by then-Rep. Martha McSally. McSally was appointed last month to fill McCain's former seat. A physician from Lake Havasu City and a former state legislator, Ward had argued that the state party needs an array of changes in the wake of a "crushing defeat" in the November general election that saw the loss of the Senate race and defeats in several other congressional and statewide races despite a voter holding a registration edge over Democrats. "We simply can't afford to let this happen ... we need to do better," Ward told the party gathering Saturday, adding later, "We have to win 2020 for President Trump." Lines, in his unsuccessful pitch to hundreds of party activists for a second term in the party's top leadership post, appealed for unity and said the party must avoid division that hampers its competitiveness. "There is so much more that unites us than divides us," said Lines, a Yuma businessman. "No one here today is my enemy." Ward said she'd work to invigorate the party's ranks of grassroots activists while boosting fundraising and positioning the party to do well in upcoming redrawing of congressional and legislative districts. "The good news is that all of our problems are fixable," she said. Reacting to the GOP vote, Democratic state Sen. Martin Quezada said on Twitter that the state GOP "has morphed into the Party of Kelli Ward. This is exactly why AZ will continue to trend blue." McCain daughter Meghan McCain on Twitter called it a "great day for Az Democrats." Also Saturday, Arizona Democratic Party officials re-elected attorney and former state banking regulator Felecia Rotellini as party chair.